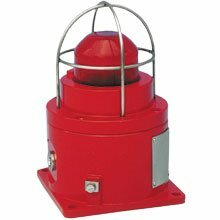 These certified beacons have been designed for use in harsh environmental conditions. The stainless steel or marine grade alloy enclosures are suitable for use offshore or onshore, where light weight combined with corrosion resistance and strength is required. Units can be painted to customer specification and fitted with identification labels. A high temperature version is available – contact MEDC for details. voltages 24-48V d.c., 110-254V a.c.
Class I, Zone 1 AExd IIB. ATEX approved Ex II 2GD. High temperature version (up to 85°C) available. Stainless steel or marine grade alloy.